Wondering how to best showcase your scout�s achievements? Look no further - our Scout Deluxe Awards and Flag Display Case can do the job, and do it with excellence. Wondering how to best showcase your scout�s achievements? Look no further - our Scout Deluxe Awards and Flag Display Case can do the job, and do it with excellence. Whether the scout is a Boy Scout, Cub Scout, Girl Scout, Brownie, Varsity Scout or Venturer, we�ve got the perfect display case for you. The Scout Deluxe Awards and Flag Display Case is large enough to fit several badges and other awards, together with a flag of your choice. Medals of Merit, camping awards, good citizenship awards, honor badges - whatever the awards, they will go hand-in-hand with an American flag or national scouting flag. Hang the Scout Deluxe Awards and Flag Display Case in your home or scouting headquarters, even your den, wherever that may be. Use this special display case in creative ways. Traditions and ceremonies are great motivators of young boys and girls. Making scouting advancement special by having a unique presentation makes scouting more fulfilling. 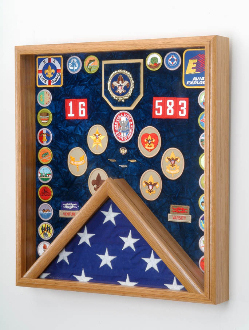 You can have small patrol flag ceremonies or a large troop court of honor ceremony for major advancements or accomplishments using the Scout Deluxe Awards and Flag Display Case for those who achieve. Trying new ones instead of your old stand-bys will keep things interesting. There are opportunities for creative ceremonies using the Scout Deluxe Awards and Flag Display Case at all levels of scouting, and whether it�s an eagle scout recognition or tenderfoot rank advancement, they can all be made special with a little effort.